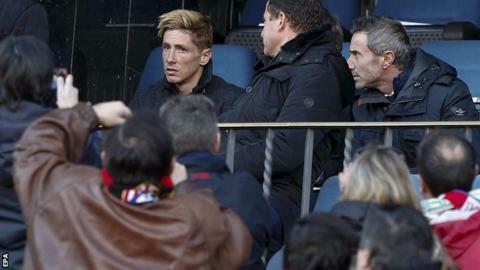 Fernando Torres watched from the stands as Spanish champions Atletico Madrid maintained their pursuit of Real Madrid and Barcelona by beating Levante. The Spain striker, 30, was not eligible as his move from AC Milan cannot be formally completed until the Italian transfer window opens on Monday. France forward Antoine Griezmann headed in either side of the break, but Nabil El Zhar's deflection gave Levante hope. Uruguay defender Diego Godin eased any worries with another header late on. The Spanish league season resumed after a two-week winter break as Atletico hosted lowly Levante at the Vicente Calderon. Victory moves Diego Simeone's side within a point of leaders Real and level with second-placed Barca, although they have played more games than their title rivals. Real travel to fourth-placed Valencia before David Moyes's Real Sociedad host Barca later on Sunday. "We should have finished off the game in the first half but we did not pressurise enough," said centre-back Godin. "My goal calmed us down as we had become nervous after conceding. "It was important for us to finish the year winning and also start with another victory." Elsewhere, Nicolas Pareja scored the only goal of the game as Sevilla claimed a 1-0 win over Celta Vigo and climbed into fourth spot above Villarreal, who were held to a 2-2 draw by bottom side Elche. Ivan Cavaleiro netted the winner for struggling Deportivo La Coruna as they edged a 1-0 victory over mid-table Athletic Bilbao, while Tomer Hemed's brace gave 10-man Almeria a surprise 2-1 win away at Malaga. Match ends, Atlético de Madrid 3, Levante 1. Second Half ends, Atlético de Madrid 3, Levante 1. Attempt missed. Loukas Vyntra (Levante) header from the centre of the box misses to the right. Assisted by Andreas Ivanschitz with a cross following a corner. Corner, Levante. Conceded by Raúl García. Attempt blocked. Andreas Ivanschitz (Levante) left footed shot from outside the box is blocked. Assisted by Mohamed Sissoko. Foul by Guillherme Siqueira (Atlético de Madrid). Nabil El Zhar (Levante) wins a free kick on the right wing. Substitution, Atlético de Madrid. Saúl Ñíguez replaces Antoine Griezmann. Goal! Atlético de Madrid 3, Levante 1. Diego Godín (Atlético de Madrid) header from the centre of the box to the bottom left corner. Assisted by Tiago with a cross following a corner. Corner, Atlético de Madrid. Conceded by Loukas Vyntra. Substitution, Atlético de Madrid. Raúl Jiménez replaces Mario Mandzukic. Foul by Giménez (Atlético de Madrid). Mohamed Sissoko (Levante) wins a free kick in the defensive half. Koke (Atlético de Madrid) wins a free kick in the attacking half. Foul by Loukas Vyntra (Levante). Raúl García (Atlético de Madrid) is shown the yellow card. Mohamed Sissoko (Levante) is shown the yellow card. Offside, Atlético de Madrid. Giménez tries a through ball, but Juanfran is caught offside. Attempt saved. Gabi (Atlético de Madrid) right footed shot from outside the box is saved in the bottom right corner. Assisted by Tiago. Koke (Atlético de Madrid) wins a free kick on the left wing. Foul by Mohamed Sissoko (Levante). Substitution, Levante. David Barral replaces Nikos Karabelas. Attempt missed. Iván López (Levante) right footed shot from outside the box is too high following a corner. Corner, Levante. Conceded by Giménez. Foul by Tiago (Atlético de Madrid). Pape Diop (Levante) wins a free kick in the defensive half. Substitution, Atlético de Madrid. Raúl García replaces Arda Turan. Attempt missed. Casadesús (Levante) right footed shot from the centre of the box is too high following a corner. Corner, Levante. Conceded by Juanfran. Attempt blocked. Andreas Ivanschitz (Levante) right footed shot from the centre of the box is blocked. Assisted by Morales with a cross. Goal! Atlético de Madrid 2, Levante 1. Nabil El Zhar (Levante) left footed shot from the centre of the box to the bottom left corner. Assisted by Iván López with a cross following a corner. Attempt blocked. Casadesús (Levante) header from the centre of the box is blocked. Assisted by Andreas Ivanschitz with a cross. Corner, Levante. Conceded by Guillherme Siqueira. Substitution, Levante. Nabil El Zhar replaces Rafael Martins. Corner, Atlético de Madrid. Conceded by Nikos Karabelas. Attempt missed. Mario Mandzukic (Atlético de Madrid) right footed shot from outside the box misses to the right. Assisted by Koke. Corner, Atlético de Madrid. Conceded by Iván López. Attempt blocked. Tiago (Atlético de Madrid) right footed shot from the centre of the box is blocked. Assisted by Antoine Griezmann. Hand ball by Koke (Atlético de Madrid).